The few days before my second ultra of the year were not ideal preparation but at least I was able to run this race again. Sadly Katrina’s Mum passed away on Saturday 2nd May and the funeral was arranged for 10.30am on Friday 15th May in South Wales. Initially I thought I wouldn’t be able to run the race as the priority was to support Katrina and her family and I thought we would be staying the night and travel home on the Saturday. Katrina had been in South Wales with her family for almost 3 weeks with her family and was happy to travel home in the afternoon. So I drove down with Jo & Jono and Hollie on Thursday afternoon arriving at 11.30pm. The service went well and Katrina gave a lovely tribute to her Mum having asked our girls to share their memories of their Mam. We left at 2.45pm and with Jono sharing the driving we arrived home at 11.45pm. 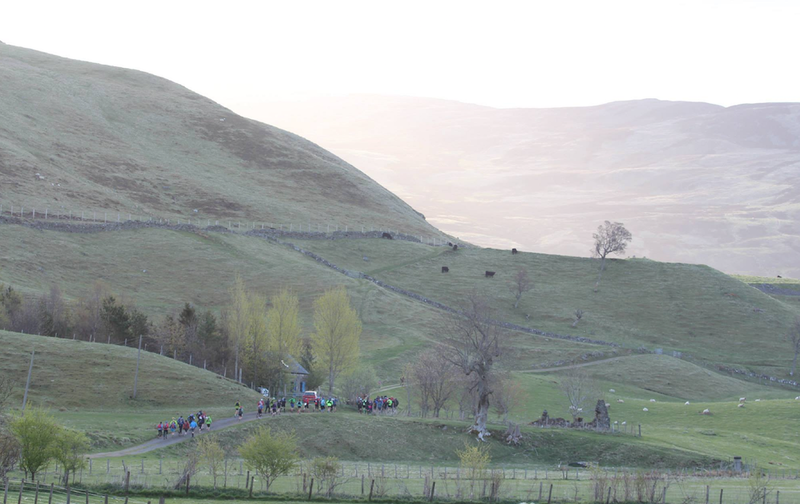 I was in bed at 12.30am up again at 4am, left at 4.30am and drove the 2hrs to Spittal of Glenshee arriving at 6.30am which gave me 30mins to register, give in my drop bags and walk to the start line! There were 75 starters in the 55 race. All the runners doing the 110 were now through and on their second lap. I saw Alyson Macpherson come through as I was getting my number. She looked in good spirits. I opted for my long sleeved green top as I knew once I got going I was soon warm up. Karen shouted go and we were off. 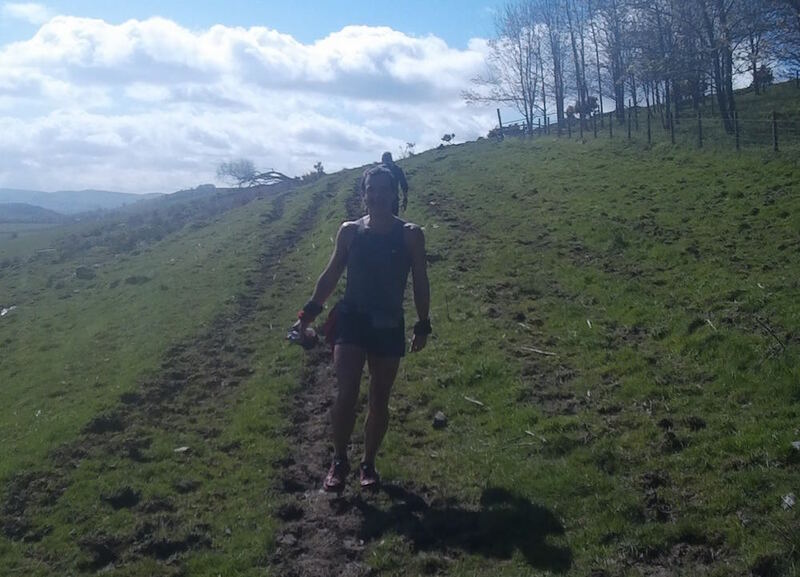 I started near the back as my plan was to run by heart rate and I wanted to ease into the race at my pace rather than feel I was being pulled along faster than I wanted. The first section is on lovely grassy paths with small up and downs and mainly runnable. I was aiming to keep my heart rate at 137 so as soon as it went over 140 I eased off and once it dropped to 135 I pushed on. Over the first 20mins or so I eased passed a number of runners having a quick chat with most. I congratulated Kirsty on her Fling run and asked her whether she felt she had recovered in time for this. 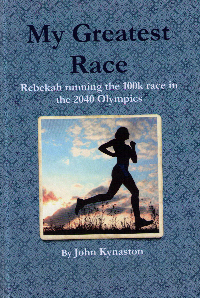 She was running with her friend Vicky and they planned to enjoy their day out on this lovely course. I caught up with Keith Mabbot and we ended up running together for the next few hours. Keith was also running to heart rate so we chatted about that and lots of other topics over the next several miles. Keith follows me on Strava and said that our pace and effort is very similar. Keith has had a sore back and so his longest run this year is only 21 miles so he wasn’t sure how he would fare after 25mile or so. According to his calculations I would finish 20mins ahead of him! I was feeling really comfortable as we came into the first checkpoint after 5.64miles. 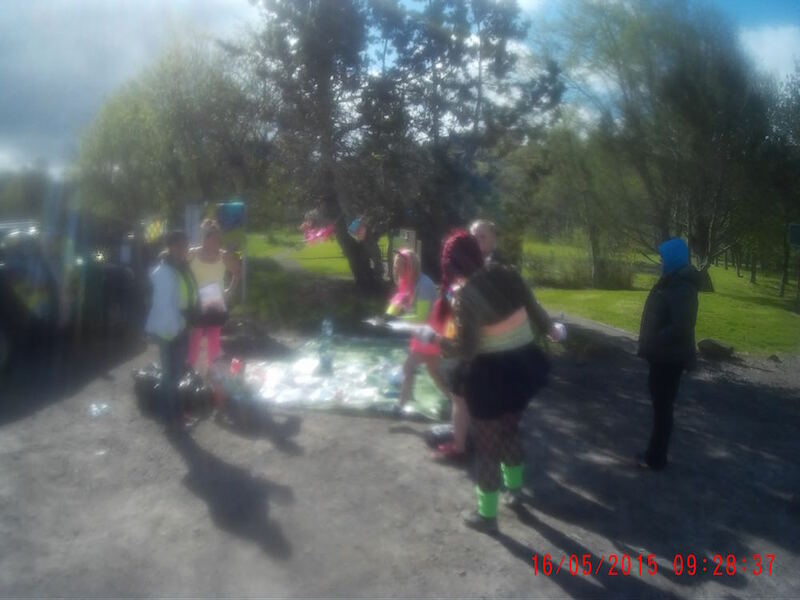 I didn’t have a drop bag here but paused to get a photo of the volunteers looking after the runners. Noanie was also there waiting for the 110 runners. After a high five I asked her how John Duncan was getting on. She said he wasn’t too far ahead so I wondered whether we might see him. Keith and I continued to chat. I discovered he works with the Navy as a bomb disposal expert and travels all over the world. He was also a top, top level cyclist competing against the likes of Chris Boardman. Very impressive! A few times Keith said his heart rate was a few beats higher than his target but we stayed together. I was keeping my HR within my zone. On the Suunto Ambit I have a screen which gives the HR graph for the previous hour or so and I was happy to see it was staying pretty level on about 135. 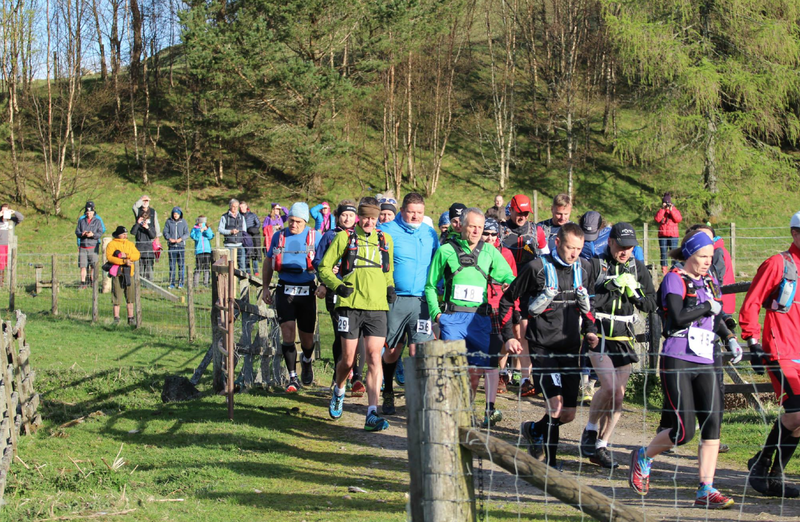 We could see John Duncan and Keith Anslie ahead and over the next hour or so we slowly caught up with them. I was started drinking my Energy drink and ate my peanut and jam sandwich. I had put on my visor as the sun was shining now. It was still fairly chilly but I didn’t need my gloves. As we came into the next checkpoint we caught up with a couple of guys doing the 110. They looked as though they were battling a bit but seemed in good spirits. Keith did the double last year so was full of encouragement for them as he had been there and knew what it felt like. As we came into the checkpoint John Duncan was leaving so I was hoping to catch him over the next hour or so. The girls very efficiently refilled my water bottle and helped me sort out what I needed from my drop bag and within a minute I was away again. Keith had been telling me that one of his aims today was to get in and out of checkpoints faster so I was surprised to leave on my own but assumed he would catch up which he did after 15mins or so. There was a slight diversion at this point but we were soon back on the course. I had my gps trace on my watch and it is always reassuring to see my triangle back on the line of the course. I ate my mashed sweet potato and cheese. I followed a tip I’d been given by biting off the corner on the plastic bag it was in and squeezing the contents into my mouth. It worked a treat as I had no sticky sweet potato on my hands!! I was slightly confused as they were either having fun with me or had gone off way too fast! When Keith caught up with me he told me it was the former as they were in the 110!! We could see John and Keith A getting closer now. As we left the road and headed up the grassy hill they were within a hundred yards. Once we climbed over the fence and into the woods Keith M stopped for a week and that was the last I saw of him until the end. He told me after the race though that for the rest of the day he could see me at various points in the distance. He finished 12mins 41 secs after me so inside his 20min prediction!! I finally caught up with John, Keith A and Meg Heaslop. John and Keith said they could hear us for ages. 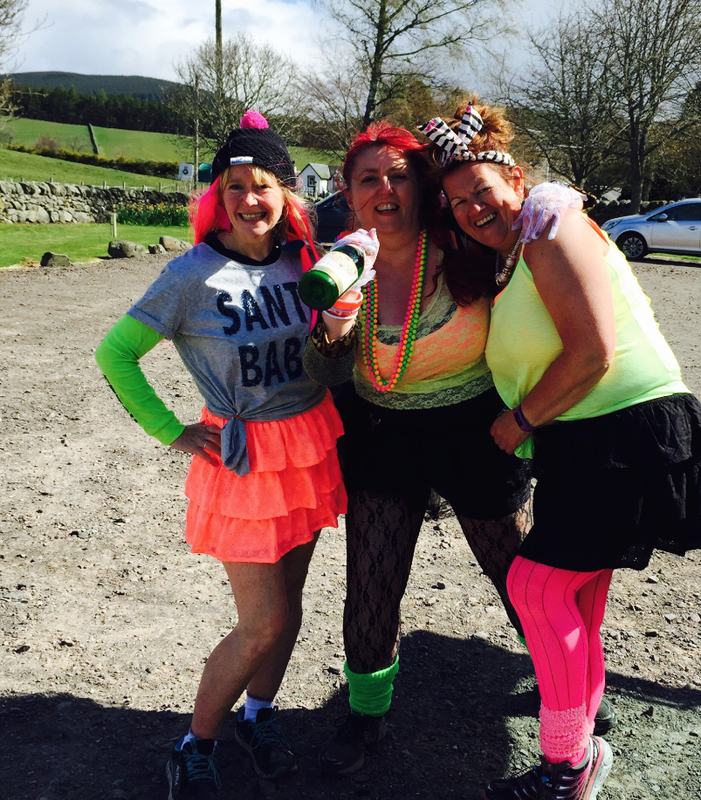 I ran the rest of the way to Alyth with them again chatting away on a variety of topics! This was just before John took his top off!! John offered to take a photo of me. Note the blue sky! I was still keeping my heart rate in check and feeling good. I couldn’t remember too much of this section so it was fun to enjoy it afresh. There is a real variety to this route. John pushed ahead a little bit as we approached Alyth so Keith and I followed him in. 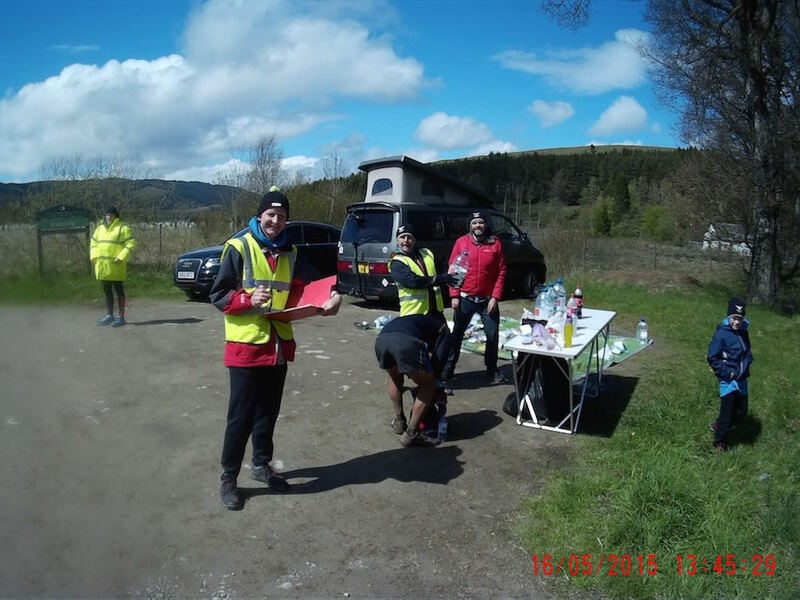 Another great bunch of people at this checkpoint including Kynon & Rhona. I ate half my small tin of beans and took a nectarine to eat on the hill out of Alyth. I left John playing on the zip wire at the checkpoint and Keith stayed longer than me so I left with Alison Wylie and we ran through the woods together. I could see a runner ahead and slowly caught up with him. He seemed to be walking most of the way whereas I was running and walking depending on my HR. 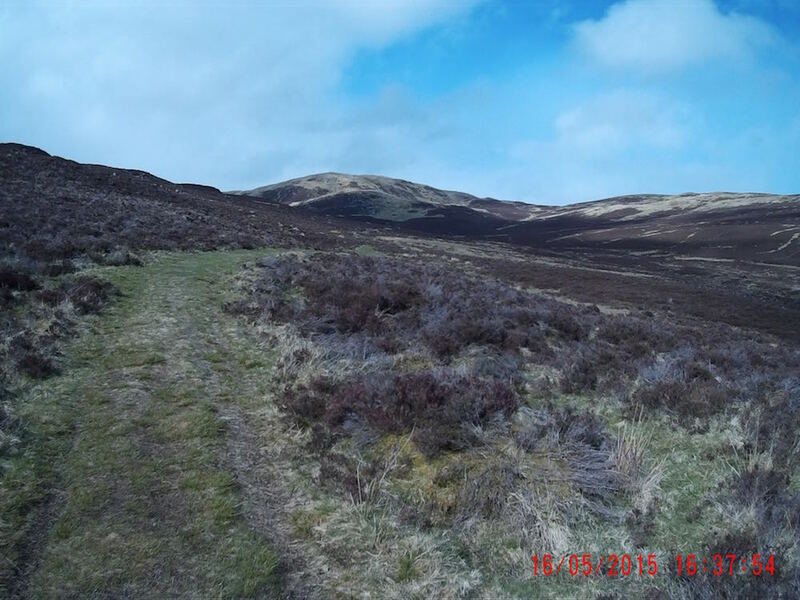 Four weeks ago I had done a recce run from Alyth to Spittal of Glenshee so from now this was all familiar ground. 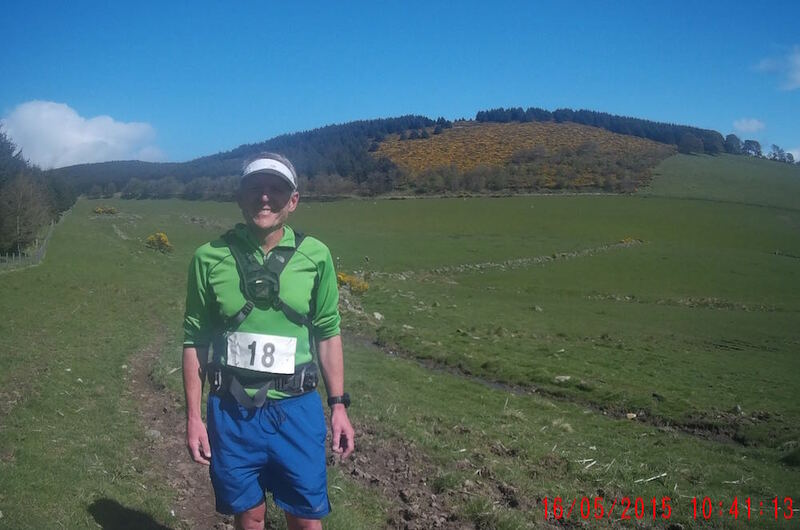 Once we got off the road and onto the trail I caught up with John Moffat. 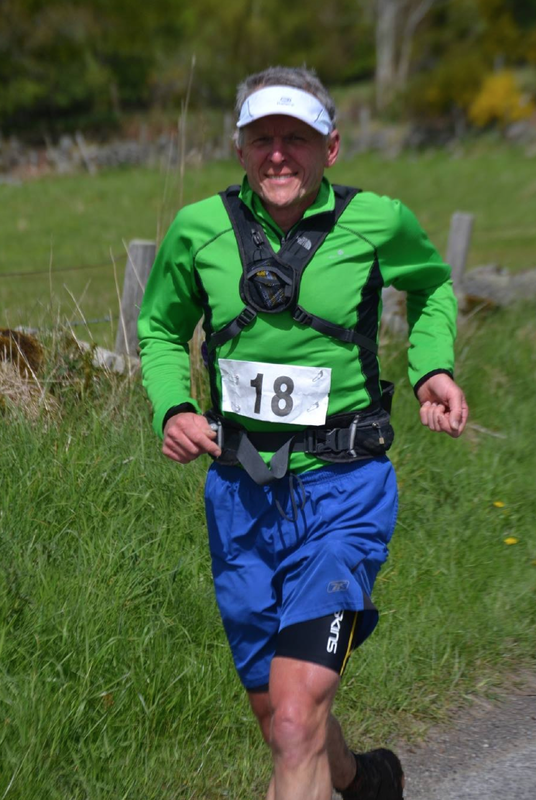 In 2013 John had caught me in the West Highland Way race with less than half mile to go and he took delight in reminding me of it!! We ran together for the next mile or two chatting about his UTMB from last year and our plans for the rest of this year. There was one really muddy bit that we both wade through only to realise that the arrows directed us around it. We both had mud caked up our shins and our shoes weighed an extra pound or two! It took a while to wipe them off. 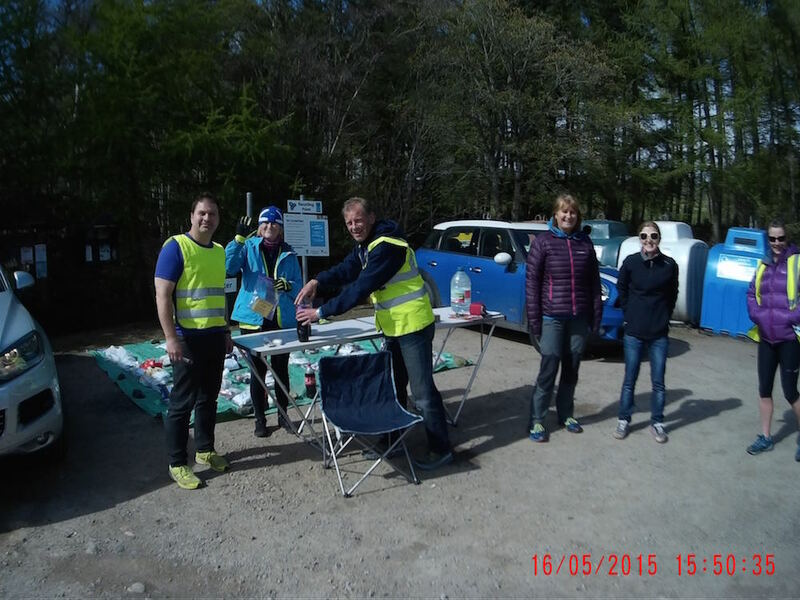 Once we hit the road I knew we had just over two miles downhill running into the checkpoint at Blairgowrie. John M was off down the hill running strongly and pretty soon John D caught me and went past. His shoes were free of mud so he obviously saw the arrows showing the way past the mud!! As I arrived John D was leaving so he wasn’t wasting any time at the check points. 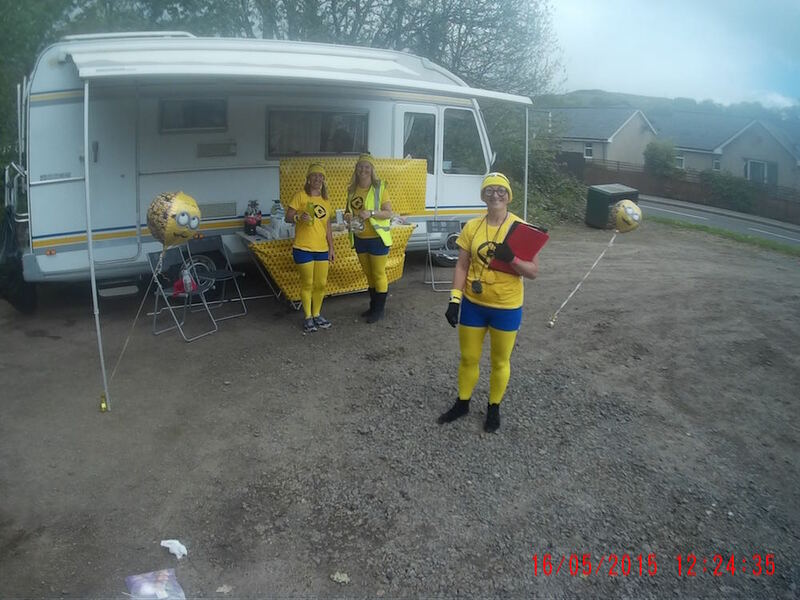 Ada and her team had gone the extra mile at this check point and were all dressed up as minions …. They were having a great time but were also very efficient at sorting me out and sending me on my way. I took with me a chia bar for the next leg. I think John M took a bit longer at the checkpoint as I left on my own. There is a climb out of the checkpoint but once I turned right and we were on the gravel path I could see John D not to far ahead. Once again I settled into rhythm of running until my HR hit 140 then walking until it dropped to 135 and repeat! John seemed to have a similar pattern but he does his by feel and how he is breathing. I went past a few people including Robin W who were out supporting. I slowly caught up with John D again and we ran together chatting about the Devils race. John has some great ideas especially about where to move the finish. I look forward to seeing how what he comes up with. I have offered my services on the marshalling duties as Katrina will still be in Indonesia that weekend. In fact she arrives home on the Sunday so it fits in well. John and I were chatting up with a couple of runners ahead. I stopped for my only wee of the race and John pushed on passing Alison. I eventually caught up with Alison and we ran in together. Ian Beattie, Mike Adams and Bill Heirs were at manning this checkpoint and once again they were super helpful and efficient in getting me in and out. I ate my favourite Greek style youghat and headed off again. There suddenly seemed to be a lot of runners around just ahead and behind. I’m not sure if I caught them at the checkpoint or they caught me. Anyway I carried on catching at least 3-4 of them on the uphill. Once we were on the downhill they all went past me again and I was on my own. I was still running strongly but I felt I was having to work that bit harder to keep my HR up to 135 or so. I was interested to see where I went wrong on my recce run and soon enough I came to the signpost that I missed. I stayed on the rocky path which heads up whereas the Cateran path drops down right to the woods. It was a lovely run through the woods and it was a lot quicker than on the recce run!! The route comes to Dalnabreck where I had my mini-split and then for the next mile and a half the ground is very boggy and uneven. I could see a few runners ahead including John D. I thought he was well away so I was actually quite encouraged to see that he was still within sight. I caught up with a couple of the runners who had gone past me on the downhill and then eventually I caught up with John again. We ran for a bit together then I must have pulled away because he wasn’t with me! I came into Kirkmichael where Noanie was marshalling. I didn’t need any water so pushed on to the final checkpoint at Enochdhu. I started to think a bit more about my finishing time and unless I was able to have an amazing final 8 miles I was going to be over 1ohrs. I always knew sub 10hrs was going to be a real challenge as my 2010 time of 10:14 was a decent time for me. Plus I’m 5 years older!! My focus then became getting a PB which meant under 10:14. I felt that was more realistic and gave me something to work on. In 2010 I wasted time after Kirkmichael by taking the river path rather than the road so I hoped that would help me time wise. I was starting to fatigue a bit now and wasn’t able to keep running as long as I should have. Instead of stopping at 140 HR I was walking when it reached 135 and I was letting it drop to 130 or below before I started running again. In the end I decided to stop looking at my HR and just go as hard as I could. I felt I was doing as well as I could. I couldn’t see anyone ahead and didn’t look behind so I was in my own little space. 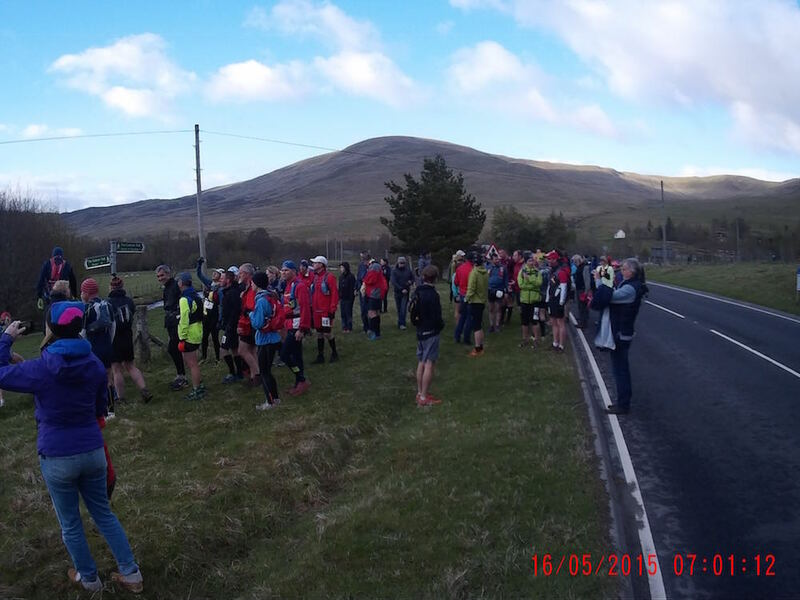 I arrived at the final checkpoint at Enochdhu where Stan, Flip and Elaine were marshalling. Another formula 1 pitstop saw me in and out in a blink of an eye. Stan filled up my water bottle with Coke and I took my clif shot bloks for the final push. Noanie was also at the checkpoint probably waiting to cheer on John. As I left she said you’ll easily make sub 10hrs. I knew differently. I had 1hr 18mins to run the final 6 miles which includes the biggest climb of the day. In the 2010 race it took me 1:22 and on my recce it took me the same so I didn’t think I could run it any faster given that I was feeling the pace. So my focus stayed on getting a PB! I worked as hard as I could up the hill. I could see two runners ahead and I sometimes I thought they were coming back to me and other times they seemed to be getting further away. I knew I could only go as fast as I could and if I caught them it would be a bonus and if John or anyone else caught me then they deserved it! I ran where I could and walked as hard as I could for the rest. The lunch hut eventually arrived so I knew I had just over 2 and a half miles to go. A final push to the top of the hill and then the long descent to the finish. I made my way down as best I could. All the way down I was convinced that John D was going to come bounding past with a big smile on his face. I was determined not to look back because I couldn’t do anything about it! I reached the style and then I pushed as hard as I could over the final bit to the final gate. I ran past a few people on the road giving them all a high five! I ran into the field and through the finishing arch. Muriel was on hand taking photos. Geraldine and Lee were recording the times and told me I’d finished 15th in 10:10:15 and as bonus as I discovered I was 1st Male Super Vet!! Over the next few hours I had a great time chatting to people, having a lovely hot shower a superb meal cooked by Sandra and Helen and watching other runners come in. 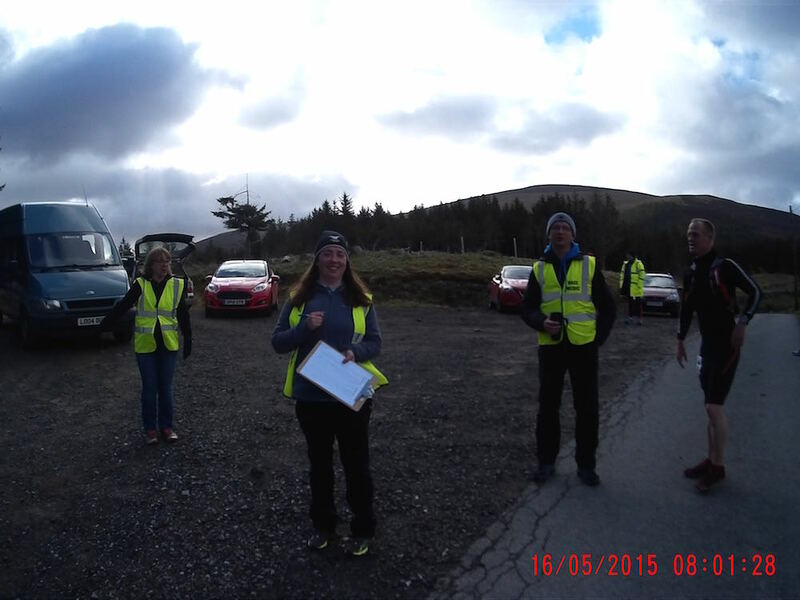 Thanks to Karen and her team of volunteers for putting on another excellent race. I’m so glad I came back for another run and I will be back again one day. Congratulations to David Wilson for winning my ‘Guess My Time’ competition. 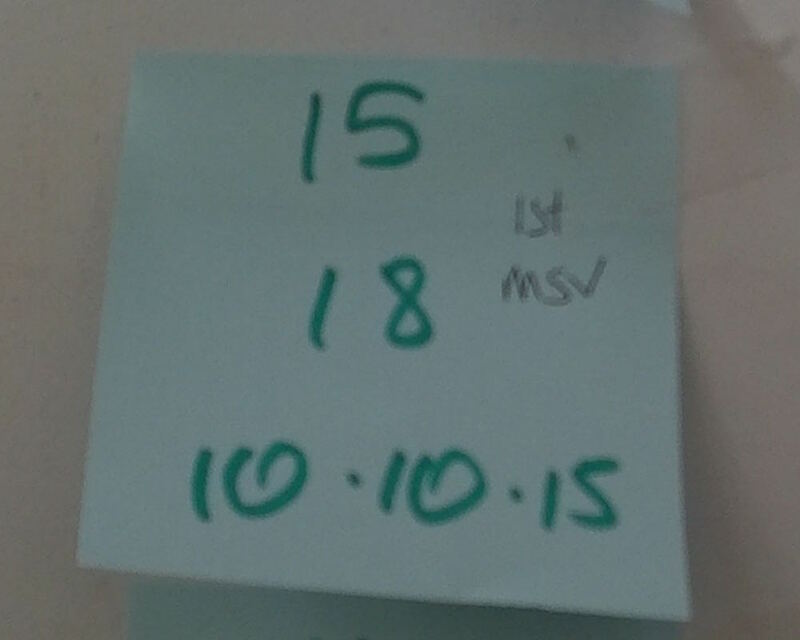 His guess of 10:10:10 was the closest. David – when you read this can you get in touch so I can send you your prizes! Finally a photo taken by John Mills which was posted on Facebook. I’m not quite sure where it was taken. 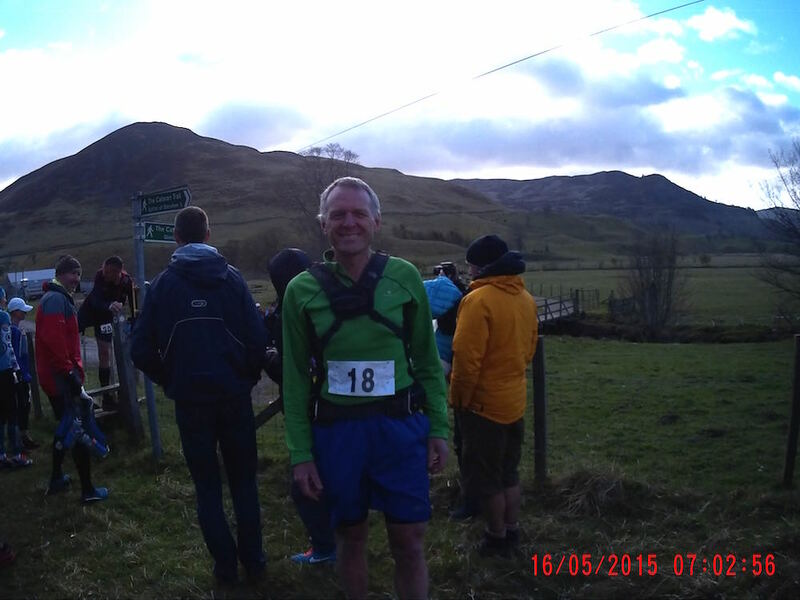 This entry was posted in Cateran Trail Race. Bookmark the permalink. Sorry to hear about Katrina’s mother passing on. Seems an a bit inappropriate to follow that with a well done on the race… but clearly it’s deserved as you’ve netted a PB, 5 years older, wiser AND faster. Sounds like the race went pretty well to plan, with a modest struggle to maintain intensity for the last leg. Have you been able to recover the full GPS/HR stats? It’d be interesting to compare between the Hardmoors 55 and the Cateran. The time delta suggests Cateran is the slower course, so the stats and accounting for nature of terrain were obviously wrong in my calculations and will need to be updated. 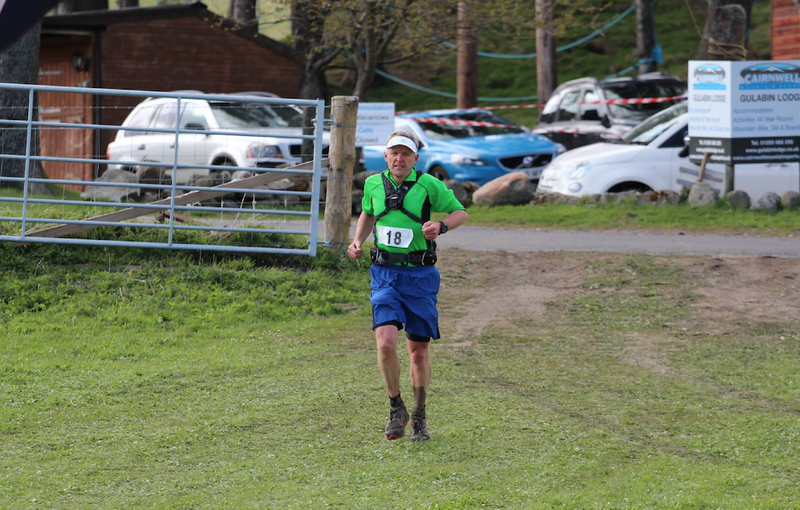 Looking at the results, Andy Johns did 9:21 in the Fling 2015, and 9:31 in the Cateran, it’ll be interesting to catch up with Andy to see how well both races compare, but if they went as well as each other then it looks like you’ll be in 10hr Fling shape. 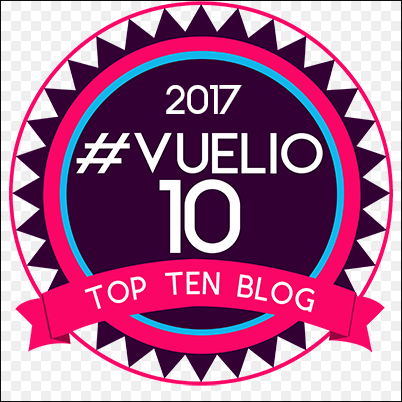 Congratulations on a great run and blog, John – a lesson to us all about running within oneself for the best result. Very sorry to hear about Katrina’s mum, which obviously makes a hearty congratulation on a great race result sound a bit hollow. Congratulations on winning the super vet category nevertheless! Great run John, when I saw the other predictions I thought I was doing you disservice but a PB is a PB and it looked like a great day for it too! I fear the 2016 Fling may clash with my wedding and if so the Cateran will be on my list of possible replacements. I’m assuming my contact email address is associated with this post somewhere visible to you?